Moorpark, CA – April 14, 2016 - NewsMaker Systems, provider of newsroom automation software, today announced its new product series providing the bridge between major MOS based newsroom computer systems and the Advanced Edition NDI NewTek TriCaster. NewsMaker Systems will be showcasing its solutions: NewsMaker Connect, Control, and Compose at NAB 2016 booth SL13105 and The StudioXperience booth SL2425. The NewsMaker and TriCaster collaboration has created a total hardware and software package which integrates directly into the MOS newsroom computer system – achieving unparalleled editorial content and newsroom control of the production process. 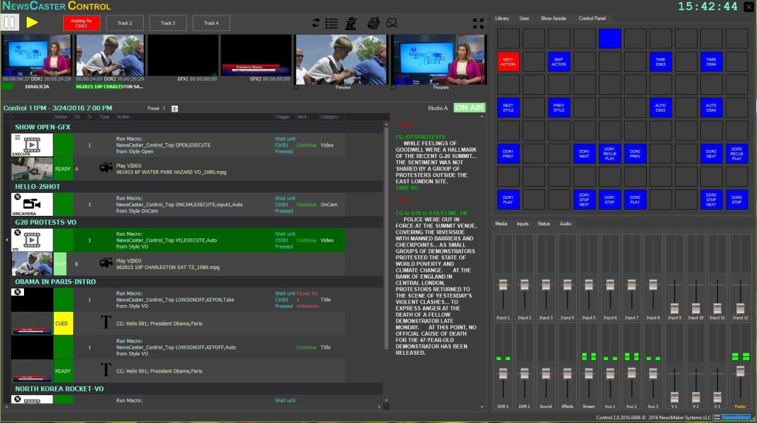 The NewsMaker MOS interface enables TriCaster production elements including Switcher Effects, Audio, IFB, Graphics, Clips, Virtual Sets and Cameras, to be placed directly into the newsroom rundown as the scripts are written. NewsMaker automatically loads production elements into the TriCaster media bins, available at the fingertips of the operator - and ready for air. Any rundown changes made in the newsroom rundown are immediately updated in the TriCaster. “NewsMaker solutions are designed to incorporate all of the TriCaster strengths and make them available to the newscast production, driven directly by the news rundown,” states Dean Kolkey, President of NewsMaker Systems.